Whether you’re working a security job or going camping in the great outdoors, tactical pants can be a great addition to your wardrobe. They usually have a ton of cargo pockets and pockets within those pockets for smaller pieces of gear, not to mention letting you move more freely. When you need comfortable pants to help you get the job done, reach for these great tactical pants. Before we get started, here are some things you should know. Material: What are the pants made of? Some great options on this list include durable Ripstop nylon, Duratex, polyester, and cotton. Some are even blends of some of these materials to keep you comfortable and last a long time. Gender: This will tell you if the pants are made for men or women. There is a massive difference in cut and sizing between men and women’s pants, so make sure you’re picking up the right one. 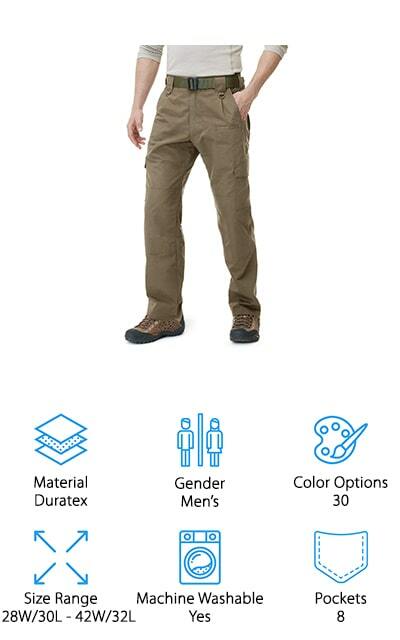 Color Options: This will tell you the number of colors that the pants can come in. Some have multiple different camouflage patterns, and some come in standard colors. Choose the color you prefer or the one that matches your uniform. Size Range: What sizes do the pants come in? You’ll want to make sure that you get the best fit so you can more easily do your job. Some even have a sizing chart to help you choose the right size. Machine Washable: Can you wash these pants in your washing machine? Most of the pants on our list can be machine washed, though some of them shouldn’t be put in a dryer. We’ll let you know the care instructions here. Pockets: Here, we’ll let you know how many pockets the pants have. This is important so that you know how much you can carry with you at any given time, great when you’re using them as military or security pants. Let’s get started with our tactical pants reviews. We’ve done all of our research in order to present you with the best tactical pants that you can buy right now. We’re sure that you’re going to find the perfect pants for you on our list! The top pick and budget pick below are the best of the best, so check them out first before moving on to the rest of the list. ZAPT makes our choice for the top tactical pants on the market right now. 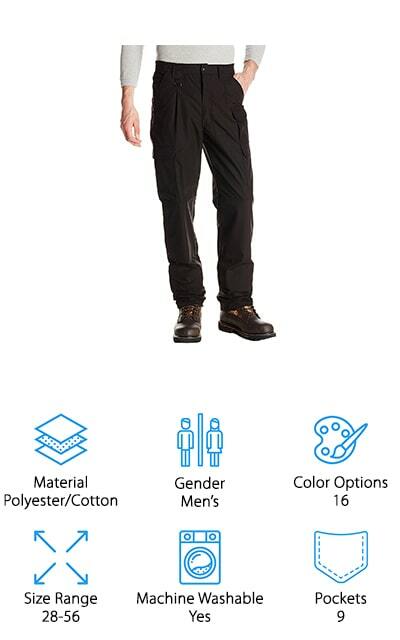 These pants are made of durable Ripstop nylon. That’s the same fabric that they make weatherproof tents out of, so you know that it’s going to last you a long time. The seat and knees are double layered with extra fabric, as these are the areas that tend to wear out quickest. You don’t have to fear ripped seams or torn knees with these pants! There is a Velcro system in the waist so that you can adjust the pants to your perfect size, adding to the customization. You can buy them in sizes small through extra-large and adjust them to fit you. All of the zippers are rugged YKK-brand so they won’t break or jam. The best thing about these pants, though, has to be the 12 different pockets where you can store all of your gear safely. These pants are durable and breathable! These men’s black tactical pants by CQR come in 30 different colors, including all of the different variations of camouflage that you could possibly want. The closure is one of the sturdiest parts of them, including a metal snap and a zipper that is durable and won’t break or jam easily. There are eight cargo pockets for all of your equipment, including smaller pockets on the inside for the small stuff you need to be able to find. 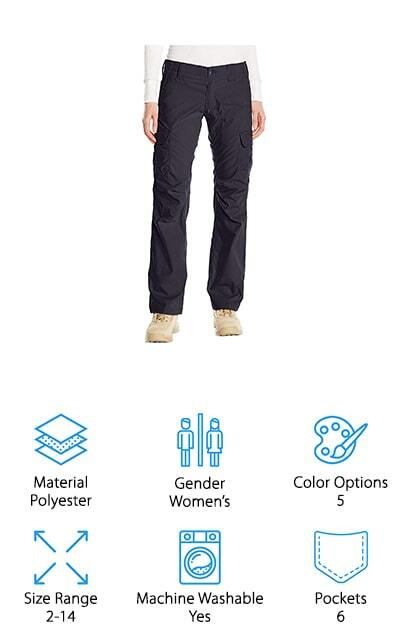 These pants have a Duratex outer layer, which works just as well as Teflon to help repel dirt, liquid, and all of the other things you don’t want on your pants. The inner layers are made of a polyester and cotton blend that stops rips and wearing, so these pants will last you forever. These are made to look and feel like army tactical pants, and you can definitely tell the difference. They won’t fade, wrinkle, or shrink! These pants by Under Armour are probably the closest you can get to skinny tactical pants. Made for women, these pants are made with a straight-legged design that eliminates the ‘flare’ effect that some other pants for women give you. They are made of 100% Polyester so they are comfortable and breathable, and you can safely wash them in the machine without ruining them. They come in five different colors, including a navy blue, black, khaki brown, white, and marine green. You can get them in sizes ranging from 2 to 14, and there is an included sizing chart so that you can get the perfect fit. One of the coolest features about these pants is the elastic on the inside of the pockets. This makes sure that your smaller pieces of equipment will stay right where you want them. These pants not only look and feel great, but they are functional and work well for law enforcement. These women’s army tactical pants by 5.11 are great for all military and law enforcement use. 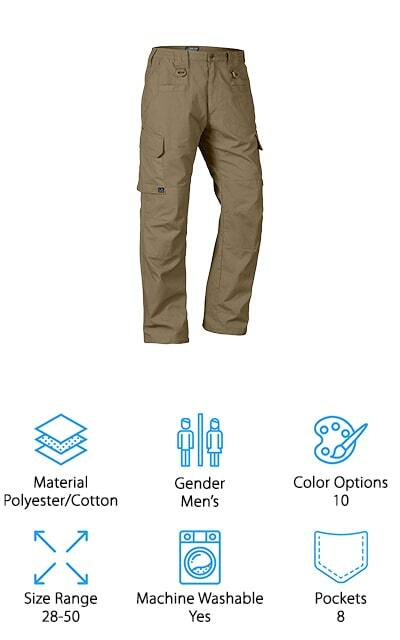 There are a total of 12 different pockets on these pants, great for holding all of your gear and making sure that you can take everything with you. They are a cotton and polyester blend Ripstop blend, so they won’t wear out easily. All of the major seams and points of stress have bartacking to help them hold up to whatever you need to do. They are finished in Teflon, which means that they will repel dirt and liquids to stay clean for longer, keeping you looking great even in the field. The waistband is fixed, so make sure that you order the correct size (they offer sizes between 0 and 20). Plus, the crotch is fully articulated so that you can move freely and comfortably. These are great pants that are great whether you’re in the military or going camping! True-Spec makes these polyester/cotton blend tactical pants with a stain-resistant Teflon coating. These pants are durable and will keep you going long after other pants would quit. The pocket design is unique and pretty nifty – the pockets look flat but expand via side gussets to help keep your gear ready to go at a moment’s notice. Each of the cargo pockets has internal compartments that are perfect for holding magazines, as well as an external cell phone pocket and knife pocket. You’ll have everything you need exactly when you need it. The knees are reinforced with extra material, with openings on the side so that you can easily attach knee pads. The coolest thing about these pants is the self-adjusting sliding waistband. There are no visible elastic gathering places on the outside, but this makes for great fitted tactical pants that will stay on your waist and give you the perfect, comfortable fit for your uniforms. 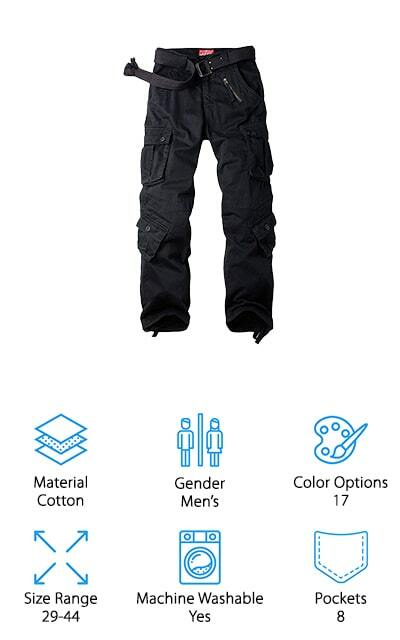 These military tactical pants by AKARMY are completely made of cotton, so they are comfortable and will keep you warm. 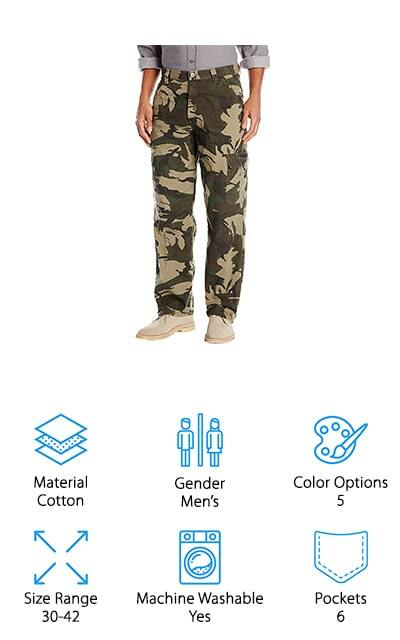 There are 17 different colors that these pants come in, including different varieties of camouflage. The left front zipper pocket is decorated on these pants, and this is just one of 8 pockets that cover these pants. You’ll have everything right where you want it. These pants should not be dried in a dryer, though they can be gently washed in the machine. This is because the fabric itself is water washed and you would lose the effect otherwise. 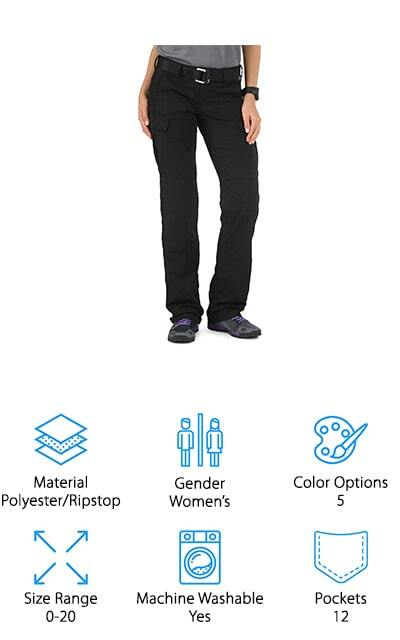 These straight-legged pants are going to look great with your uniform no matter what color you need to purchase, and you can even use them for leisure activities or hiking and camping as well. The belt is separately included, so make sure you get one if you need it! They come in a range from 29 to 44 wide for comfort! 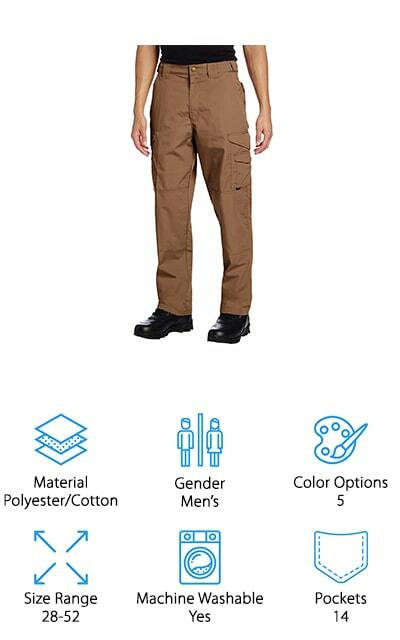 LA Police Gear makes these tan tactical pants that also come in a variety of colors, including black and dark blue. They close with a zipper, and that zipper is a heavy-duty YKK construction that won’t break or jam easily. The listed size (between 28 and 50 wide) is the pants with the elastic stretched out fully. If you’re looking for pants that you can adjust or grow into, you might want to increase the size. The cargo pockets have a top pass through so that you can get to them quickly, and they are slanted so that you can access the pockets while seated. The elastic waistband, however you want to wear it, is great for concealed carry because it can easily accommodate a holster or a weapon. The crotch is gusseted to allow ease of movement, no matter if you’re on a law enforcement team or going on a long camping trip in the woods. 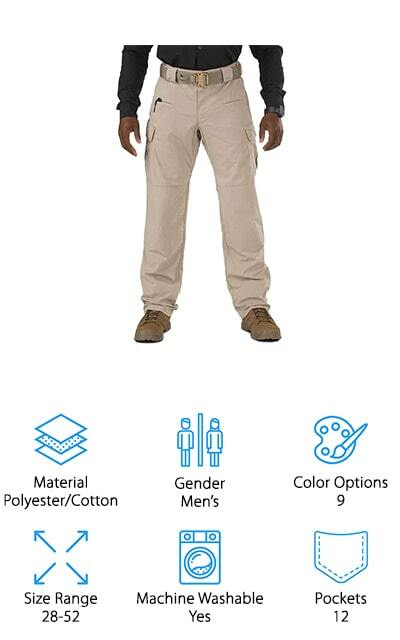 Wrangler is one of the best-known brands for hard-working clothes, and these cargo pants are no different. They are lined with fleece, which makes long nights out on the force that much more comfortable. They come in grey, tan, and a camouflage color, so there’s a pair for every type of uniform. You can wash these pants in the machine and dry them in the dryer with no problem. They have a relaxed fit with slanted side pockets so that you can get to your stuff while you’re sitting down. These pants will fit well over the top of your favorite work or combat boots. The fly is a strong, durable zipper and a button. The fleece doesn’t add much bulkiness, so you won’t have to change the way that you move. Store all of your gear in six accessible cargo pockets. You can get these pants in sizes between 30 and 42 in width for a great fit. 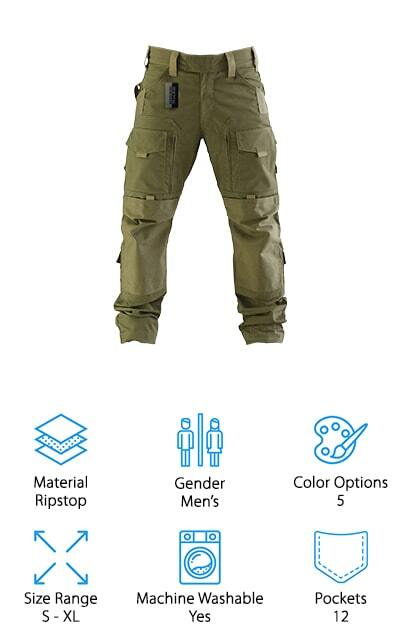 These Propper Tactical Pants come in 16 amazing color options, so you can have a pair for a relaxed weekend outdoors as well as a pair for your work days. They are made of a polyester and cotton blend, with an outer fabric protector of Teflon. This repels all stains and liquid so that your pants can last forever. Even with the additional Teflon, these pants are fade-resistant, shrink-resistant, and wrinkle-resistant. These pants are absolutely amazing, and you’re going to wonder how you ever functioned without them. It features YKK zippers that are durable and won’t break easily. It even comes with extra-large loops to thread your belt through, so even nylon duty belts are accommodated. Propper really has thought of it all with these pants. The back pockets close with a hook and loop and include smaller pockets within that are perfect for holding your wallet or cell phone. These pants fit like a dream! 5.11 is back on our list again with these OD green tactical pants. They are made of a polyester and cotton blend with a two-way mechanical stretch, so they are both durable and lightweight. You’ll be comfortable while you’re out working, no matter what you do. There are 12 pockets, including cargo pockets that are twice as deep for all of your longer gear. Articulated knees and a gusseted crotch make them great for any type of movement, and you’ll be good to run, crawl, and kneel at a moment’s notice. Each seam is triple-stitched, with bartacking at all of the major seams for that added durability. The fabric is treated with Teflon so spills, stains, and dirt won’t get anywhere near your pants. The YKK zippers and Prym snaps protect your closures, to make sure your pants continue to work for you even after continued use. You’re going to love these pants for the long haul!